Pocket Monsters The Movie "Everyone's Story"
Dogasu's Backpack | Movies & Specials Guide | Pocket Monsters The Movie "Everyone's Story"
Note: There is a lot that happens in this movie and it is entirely possible that I've left some events out / have inadvertently listed some events out of order. I apologize for any inaccuracies that may pop up. School's out for the day at a high school somewhere. One of its students, a young girl named Lisa, watches the track and field team for a bit before leaving her classmates to go visit her younger brother Riku in the hospital. He has a favor for her: can you please go to the Wind Festival in Fuura City and get a particular pokemon for me!? After all, I can't do it myself - my leg's still in a cast! Lisa's reluctant at first but she eventually agrees. Riku gives Lisa a pair of sunglasses and an empty Monster Ball. Inside a large mansion, a little girl Largo is woken up by the sounds of fireworks off in the distance. She runs out onto her balcony to look at the city. Below, her father Oliver, the mayor of Fuura City, climbs into a car headed for town. Before he leaves he yells up to his daughter and asks if she's going to the Wind Festival. She responds that she is. Poppo fly past the screen. The camera follows them as they fly toward the city. 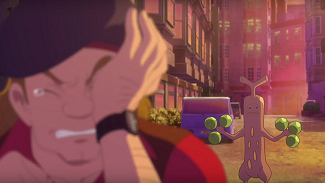 The movie's title, Pocket Monsters The Movie "Everyone's Story," is displayed. It's the popular online show Pokemon Channel hosted by MC PokeRan! Today's episode: What is the Wind Festival? Well, it's a festival held once a year to celebrate and give thanks to Lugia, the legendary pokemon who's been bestowing the gift of the wind to the people of Fuura City for years. Legend has it that Fuura City used to be a barren land with nothing on it until people and pokemon all came together to build it up into the city we see today. Lugia decided to reward this outstanding display of camaraderie by coming by every year to grant the power of the wind to help the town continue to flourish. Satoshi and Pikachu have arrived in Fuura City and are riding a cable car. There are so many attractions and so much delicious food around...where to start!? Inside Fuura City, a man named Kagachi is walking around the streets with his younger sister Mia and his niece Lily. 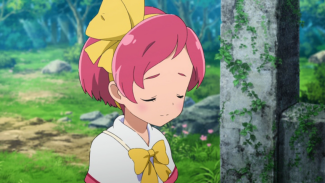 Kagachi tells Mia's daughter that he's a great Pokemon Trainer and that he has an amazingly rare pokemon but that it's tired from a recent battle so he can't really show it to her right now. Mia can smell his bullcrap from a mile away but doesn't say anything. Kagachi then turns to Mia and ask her how Lily's doing these days. It seems like she has some kind of health issue? Mia responds that, as he can see, she's been energetic lately. A young researcher named Torito is on the phone when he receives startling news that causes him to drop all the papers he was carrying. What!? The person who's meant to give that big presentation tomorrow isn't coming!? And Torito will have to give the speech instead!? The townspeople around him try to help pick up the papers he's dropped but the frazzled researcher asks them not to touch anything. An old woman named Hisui is looking at a bunch of sunflowers when a Kimawari suddenly appears out of nowhere to say hello. Hisui jumps back and yells at the pokemon to go away; can't she even look at flowers in peace!? She walks away and is soon approached by three boys selling lemonade from a cart. One of the boys tries to get her to buy some lemonade from them but the sight of his Gomazou scares her off. The other two tells the Gomazou Trainer that Hisui is famous around these parts for not liking pokemon. Largo is running through the streets clutching a bag. She's not really looking where she's going and accidentally knocks into the cart of lemons the boys are pulling. The kids are upset that the mayor's daughter's got lemons everywhere and demand she do something to pay them back. 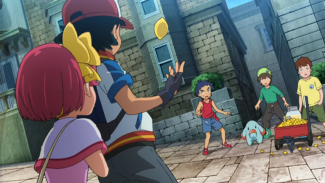 One of the boys angrily throws a lemon at her but Satoshi appears out of nowhere, catches it, and tells them to lay off. The boys respond by having Gomazou attack. Satoshi's Pikachu uses Iron Tail to make quick work of the little elephant pokemon and sends the three boys running off. Meanwhile, the Rocket trio are revealed to have been watching from around the corner. Kojirou wants to steal Pikachu but Musashi has a better idea; why don't they just sell fruit juice instead? After all, it would be easier and more profitable, right? Kojirou is aghast at this idea but Nyarth breaks out a calculator, crunches the numbers, and decides Musashi has the right idea. After the expected introductions are exchanged Largo tells Satoshi about the Festival of Wind and how Lugia is said to come on the final day of the festival to bestow its blessing to the townspeople. She also points to a lighthouse in the distance where the sacred flame resides; the flame, she explains, is used to help guide Lugia to the city. A little further off from the lighthouse is an old abandoned power plant but that was ruined in a fire 50 years ago and isn't used anymore. Largo also tells Satoshi about an event called the "Pokemon Get Race," a competition where people try to see who can get the most pokemon in a certain amount of time. She points Satoshi in the direction of the area where he can sign up for it before resuming her way to wherever it was she was heading. Elsewhere, Kagachi manages to win a stuffed Pippi doll for his niece. 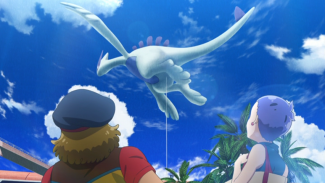 After he hands it over Lily looks up, sees a giant Lugia balloon, and asks what that pokemon is. But Kagachi can't just tell her; he has to jump up onto a high area in the middle of a park and deliver a grand speech in front of everyone! He tells her (and the people gathered around) that the pokemon's Lugia, a legendary pokemon who used its mighty power to put out a great fire that took place near Fuura City 50 years ago. "And they all lived happily ever after." Torito, who also happened to see this mini performance, tells his Lucky that he wishes he could get up in front of people as confidently as this guy can. Lisa wanders into the area and accidentally bumps into Lily's uncle. The Monster Ball Riku gave her falls onto the ground, opening upon contact. As Lisa picks herself up Lily notices the empty Monster Ball and asks where her pokemon is. Lisa takes our her smartphone and tells the family that she doesn't have it yet; she's looking for the pokemon depicted on her screen. Lily says her uncle's a great Pokemon Trainer and that he knows e~verything and that she should just ask him. Kagachi begins to flop sweat. Oh, that pokemon? It's...um...it's really quite rare! I've heard reports that it can be found...um...out in the mountains! Yeah, that's it! The mountains! Lisa thanks Kagachi and runs off. Satoshi and Pikachu are off playing in a nearby fountain. 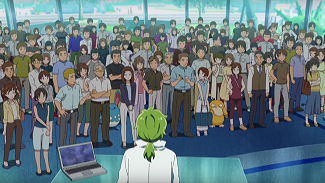 An announcement over the city's PA system tells the citizens that the Pokemon Get Race - the one that Largo mentioned earlier - is about to begin. Lily also hears the announcement and convinces her uncle to participate. Kagachi reluctantly agrees. Old woman Hisui visits Torito's laboratory in the city to get him to sign some paper. When she walks into the room she's startled by the sight of his Lucky and jumps back, knocking over a flask of liquid. Torito apologizes as Hisui asks if he's trying to kill her or something. After she checks to make sure none of it splashed on her she hands over the paper for him to sign. After she leaves, Kagachi bursts into Torito's lab. You're a pokemon researcher, huh!? That means you must know a lot about pokemon right!? Torito recognizes Kagachi as that man from the park. Out in the mountains just outside town, Largo takes some Berries and a drink from the bag she was clutching onto earlier and places it onto the steps of an abandoned building. After she leaves a shadow can be seen approaching the food. Later that day, the "Pokemon Get Race" is about to start! Music plays throughout the square as a disguised Rocket trio sell Lum Berry juice. Mia and Lily, as well as Lisa, are all watching separately. In the Pokemon Get Race, Trainers are tasked with getting as many pokemon as they can within a certain time limit. 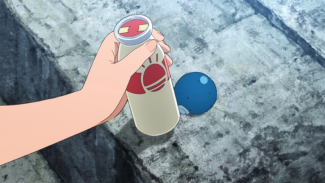 They'll use special blue Monster Balls to catch pokemon sporting special stickers on their bodies. Trainers are also allowed to use one of their own pokemon to help weaken their potential prey. Satoshi enters with Pikachu while Kagachi enters with...Torito's Hitodeman!? 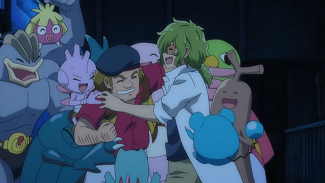 It seems that the two of them have struck a deal; Torito helps Kagachi win the Pokemon Get Race by feeding him advice via an earpiece and Kagachi, in exchange, will give Torito's presentation for him. It'll be a win-win, right? And we're off! Satoshi quickly finds an Arbo and, after weakening it with his Pikachu, gets it in his blue Monster Ball. Kagachi, meanwhile, gets himself a Kirinriki. He quickly makes it to first place as Torito feeds information to him via an earpiece. At one point in the competition Kagachi comes across an Usokkie being terrorized by a Golduck. Torito yells that going after those two aren't worth it and that he can get more points going elsewhere but there's something about this Usokkie that piques Kagachi's interest. Maybe it's the way its cry, "uso! uso! ", sounds like it's saying "you're a liar! you're a liar!"...? He throws a Monster Ball, Usokkie ducks, and...Golduck is caught. As Kagachi leaves, he tells the bewildered Usokkie to not be a liar like him. Elsewhere, Satoshi has just finished getting an Otachi when he comes across a Bangiras who's somehow managed to get pieces of rope wrapped around its neck. The ropes' tight grip is obviously causing Bangiras distress so Satoshi stops what he's doing to help the pokemon and calm its rampage. He has Pikachu nudge it toward a more open area with its electric attacks so he can jump onto Bangiras' back and attempt to hold it down while Pikachu uses Iron Tail to cut the ropes. The plan works and Bangiras stops its rampage as soon as its noose is gone. This performance earns Satoshi a round of applause by the spectators who have gathered around him. The competition ends with Kagachi getting first place and Satoshi getting second. 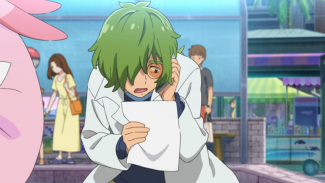 During a post awards ceremony interview, Kagachi panics when asked how he won and comes up with a story about there being a "su~per rare pokemon around here!" This statement of his gets Satoshi, the crowd and all the people gathered around excited. A super rare pokemon!? Here!? Largo, who's been watching the competition this whole time, runs off with a grim look on her face. Pokemon Channel! Exciting news, everyone! We've just heard there's some super rare pokemon near Fuura City! What could it be!?!! News of the super rare pokemon soon spreads to people all throughout the Internet thanks to the popular web show. Elsewhere, a pair of Pokemon Hunters watch the broadcast before hopping into their jeep and driving off. As the sun sets on the first day of the Wind Festival, Hisui finds herself being followed by a bunch of wild pokemon. Why is she so popular all of a sudden? Kagachi also finds himself being followed, only this time by the Usokkie he saved earlier. 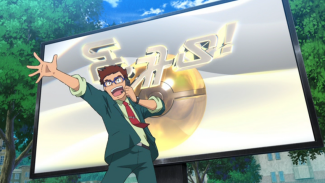 He yells at the Rock-Type pokemon that the competition is over and they've all returned the pokemon they caught and everything so it should just go home. Largo is eating dinner with her father at home. 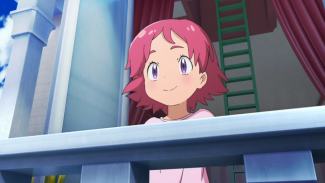 After she tells him about the rides she went on and the various attractions she saw she brings up the story Kagachi had told about the super rare pokemon. Does he think that man was talking about Zeraora? Her father's chipper demeanor suddenly turns cold. Largo is told that talking about that pokemon will only upset the townspeople and that she needs to stop spouting such nonsense right this instant. Out in the woods on the outskirts of the city Lisa is clearly exhausted. Her hair is a mess and her eye make up is smudged and she's exhausted but that stupid pokemon isn't anywhere to be seen! A flashlight is suddenly shone in her face as two police officers approach her to ask what she's doing out there. She takes out her smartphone and tells them that she's looking for this super rare but they tell her that that's just a regular old Eevee. It seems like that old man in the town was lying! They also tell her that there aren't any Eevee out there and that besides, the forest is off-limits because of something called "the curse of Zeraora." They tell her to go home right away. Back in the city, the Rocket trio have snuck into Torito's laboratory to see if there's anything there worth stealing. As they look around they accidentally knock over an Erelenmeyer flask filled with some unknown liquid. Startled by the sound of breaking glass the Rocket trio make a hasty exit. Torito and his pokemon walk into the room to see what that noise was and find the broken glass on the floor. Hisui gets home only to find that pokemon have now followed her into her house! An exasperated Hisui decides to sleep on her porch swing outside. Satoshi is about to ride the elevator of his hotel down when he's approached by the worn out Lisa. She recognizes him as one of the contestants in the Pokemon Get Race and, figuring that he's a decent Pokemon Trainer, asks for his help. 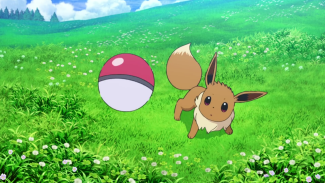 The following morning, Satoshi goes with Lisa to some nearby field to find an Eevee. They eventually do and so Satoshi lends her his Pikachu to help her catch her very first pokemon. Satoshi more or less tells Lisa what to order Pikachu to do and before long Eevee is weakened enough to be caught in Lisa's Monster Ball! After a few moments the Monster Ball flashes to indicate that Eevee's been caught! Lisa's ecstatic that she's finally got the Eevee that her brother asked her to. The two of them get to talking and Lisa brings up how she never got into training pokemon because she spent all her time practicing to be a track and field star instead. A leg injury put an end to those dreams, however, and though she's fine now the idea of her ever running again is just too scary. Satoshi tells her that he believes she'll run again someday. 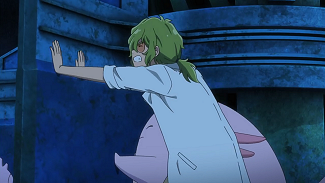 Hisui visits Torito's lab, obviously upset. Now there are even more pokemon than ever following her around! Torito wonders if this has something to do with her bumping into a vile containing Sweet Scent the day before...whatever it is, Hisui demands that he do something to remove the effects right away. When Satoshi and Lisa return to Fuura City they find a city in panic! It seems like some prankster has done things like place rocks inside the tramway tracks, cut the power to various rides, and turned fountains into massive foam baths. For the time being, anyway, the Wind Festival is going to have to be postponed. The mayor can be seen running around. Lisa finds Kagachi and his family milling about and demands to know why he lied to her about there being an Eevee out in the mountains. Kagachi runs over and shushes her, as his niece is right there, and begs her not to blow his cover. Lisa, not wanting to see a little girl cry, reluctantly agrees. 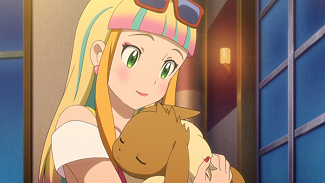 She plays up the idea that this great man Kagachi helped her find an Eevee and that she couldn't do it without his help. Lily seems to buy it and cheers at how great her uncle is. Eventually, Satoshi approaches the mayor and says that we'll help them clean things up. Lisa's shocked; what's this "we" business? Satoshi reasons that the sooner they get everything cleaned up the sooner the festival can resume and so Lisa has no choice but to agree. She turns to Kagachi and tells him that he's helping them too; after all, it's the least he can do for her not making him look bad in front of his niece. 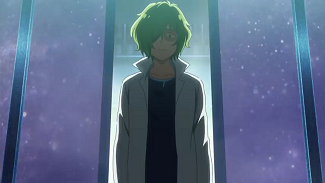 Kagachi needs to get to the laboratory to give Torito's speech but he doesn't see any way out of it. The mayor is happy to have everyone's help. For the next few moments (hours, maybe?) the people of Fuura City work together to clean up the mess around town. In one area, Satoshi, Largo, and the lemonade stand kids are all helping sweep up some foam created in a nearby fountain. As they clean all this up the lemonade stand kids from before decide that all this is happening because of the curse of Zeraora. That mythical pokemon is the reason all this is happening, they just know it! Largo angrily jumps to Zeraora's defense but is interrupted when an announcement over the PA system informs everyone that all the safety checks are finished and that the festival can resume. Kagachi realizes that it won't be long before Torito's speech starts so he tries to give everyone the slip. 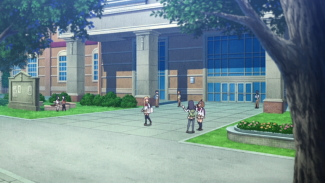 He's spotted running away, however, so Satoshi, Lisa, Largo, Mia, and Lily all run after him. People are beginning to gather around for Torito's big presentation outside in front of his lab. Unfortunately Torito doesn't can't wait for Kagachi any longer; he has to give the speech now. Hisui watches from inside. Torito awkwardly walks up to the podium and tries to give something resembling a speech but the whole thing is him just stumbling over his own words. Torito's colleagues look on nervously; this is just not going well. 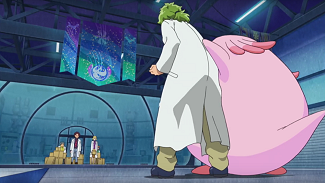 Kagachi, meanwhile, somehow manages to hitch a ride on the back of a Dodo and is carried the rest of the way to the laboratory but he sees that he's too late. It seems like all he'll be able to do is stand there and watch. Satoshi and the others soon catch up as well. The other scientists see Torito floundering around out there so they tell him to play the video presentation they had prepared. Torito puts in the SD card and, on the big screen in front of everybody, he shows them...footage from Kagachi's headset!? Footage that shows Kagachi receiving guidance from Torito for the Pokemon Get Race!? One of Torito's colleagues goes on stage and turns off the monitor but the damage has already been done. Kagachi isn't some great Pokemon Trainer!? And Torito helped him cheat!?!? With this, Mia approaches Kagachi and demands he explains what's going on. Kagachi nervously backs into one of the other audience members, causing the Monster Ball he keeps on him to fall off his belt. The ball opens upon hitting the ground, revealing nothing inside. Kagachi's lies catch up with him all at once and so his niece Lily begins to cry. She can finally see that her uncle is a liar! "I hate you!" she shouts before running off. Mia chases after her. Inside the lab, meanwhile, Hisui hears a noise. She goes into Torito's lab to investigate and comes across the Rocket trio! 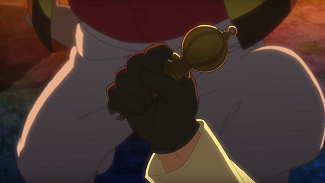 And they're holding some kind of glass container? The trio drop a smoke bomb and make a run for it. Before long, smoke the from trio's bomb starts to seep outside. The crowd, who's already in a tizzy over the big "Kagachi is a fraud" reveal, starts to panic. As people run around Lisa's Eevee gets caught in the stampede of people. Lisa wants to run out and help but she hesitates, allowing Eevee to be knocked aside. As Lisa runs over to her pokemon Satoshi looks around and spots the Rocket-Dan making a run for it. He instantly recognizes the trio as the ones responsible for this so he runs after them. 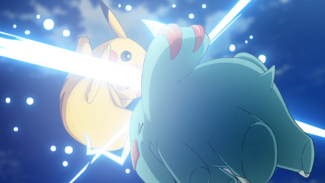 He orders Pikachu to use Thunderbolt attack but Musashi's Sonansu uses a Counter-type attack to repel Pikachu's electricity. 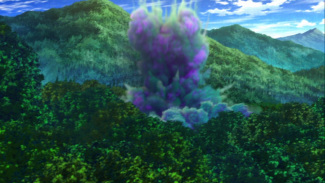 The smoke from the resulting explosion covers the trio as they make their getaway. Everyone else has, meanwhile, gathered at the Pokemon Center. Joy tells Lisa that her Eevee's leg hurts a little bit but that other than that it should be fine. Lisa's still bummed out though; if she hadn't hesitated to run toward her pokemon maybe this whole thing could have been avoided. 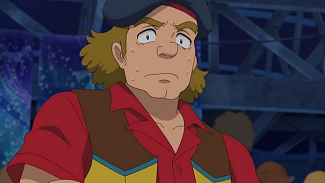 Satoshi runs in and apologizes to everyone for letting the Rocket trio get away. Torito tells the group that the trio stole some special "Spore Medicine" that he was researching to see if there's any practical application for humans. Hisui pops up to say that it's getting late and that everyone should just go home and get some rest. Kagachi goes back to his hotel room and finds that Lily is asleep. Mia tells Kagachi that since Lily's been through so much it'd probably be best if they just go ahead and leave tomorrow. Kagachi tells his younger sister that he can't face Lily anymore and decides he doesn't deserve to be in the same room as them. After he leaves Mia thinks about what a foolish man Kagachi is. Back at her house, Hisui continues to have trouble with pokemon following her. Outside, Usokkie is still following Kagachi around. Kagachi yells at the pokemon and tells it to go away. Later, Kagachi throws his empty Monster Ball into a trash can and resigns himself to sleeping on a park bench. Out in the woods, the Rocket trio are celebrating their successful theft. They did it! Musashi tells Nyarth to hand over whatever it is they stole but Nyarth says he doesn't have it. She tells him that when they were running she threw it behind her and shouted "Here Nyarth, catch!" but Nyarth says he was running in front of her the whole time. So then who caught it...? Before long it becomes clear that the Rocket-Dan have lost the Spore Medicine. Hisui wakes up and walks outside and...what's this!? She can see that the sacred flame is gone! And the wind isn't blowing anymore! Pokemon Channel! The sacred flame has been stolen! How will Lugia know where to send the wind now!? In the laboratory, everyone but Torito is helping to pack things up. One of the researchers complains about how Torito ruined everything and that they never should have agreed to team up with someone so useless. Another researcher (their boss, maybe?) interrupts them to say that Torito did his best and that they should stop their gossiping at once. After all, does anyone here know more about pokemon than Torito? 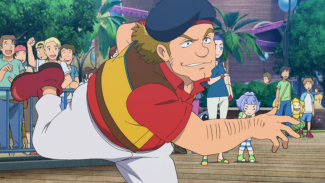 Is there anyone here who cares about pokemon more than Torito? Unknown to them, the topic of their conversation is standing just outside, listening in on the whole thing. Just outside the lighthouse where the sacred flame once was the mayor and his co-workers have gathered. Satoshi and Lisa run up to them and ask if it's OK if they get a look at the scene of the crime up close. He agrees and before long they're riding up on an elevator to the top of the stand. Lisa screams, as she's afraid of heights, and once she arrives at the top she clutches for dear life on the handrail nearby. Pikachu and Eevee, meanwhile, sniff the area where the flame was and seem to have picked up something. Our heroes decide to follow their lead. Before long, the scent leads to...Torito's Doble!? Torito is sitting outside under a tree with all his pokemon out of their Monster Balls when they're approached by Satoshi and Lisa. After being filled in on the flame's theft Torito guesses that Pikachu and Eevee have picked up on the scent of his Doble's ink. But waitaminute...wasn't one of the vials that was dropped in his lab made from the extract of Doble ink? Satoshi and Lisa take Torito to the lighthouse where he uses a special flashlight to make the footprints visible to the naked eye. If they follow this trail, they figure, they'll be able to find out who stole the flame! Out in the forest, Largo is hanging out with a wild Himeguma and Metamon. The stolen flame is resting against a wall in the abandoned building behind her. This time, she thinks, the Wind Festival is definitely going to be postponed. She looks into the building and tells her friend, the mythical pokemon Zeraora, that it just needs to wait a little while before this whole "su~per rare pokemon" thing dies down. Meanwhile, the two Pokemon Hunters who had seen Kagachi's statements before are wandering the forest in search of rare pokemon. After catching a wild Otachi they look over and see the old abandoned building where Zeraora is hiding. Largo hears the hunters coming and tells Zeraora to hurry up and hide. She then approaches the hunters and, putting on the most innocent-sounding voice she can, asks the two what they're doing there. They respond by asking the lil' lady if she's seen any rare pokemon around. She says that she has and points randomly off in the distance. They thank her and are about to go on their way when they spot the wild Himeguma and Metamon who are with Largo. The Pokemon Hunters decide they'll get a lot of money for those two and let out their Hellgar and Nyula to battle it. A clearly shaken Largo argues that if they waste time catching these two that the super rare pokemon will get away but they don't listen. The two pokemon are ordered to attack but Zeraora jumps in at the last second to shield Largo and the others. At last, the rare pokemon has arrived. The Pokemon Hunters quickly turn their attention to the mythical pokemon before them. Zeraora is still weak from when it apparently helped out Largo a few days earlier so it quickly succumbs to the Hunters' pokemon's attacks. One of the Hunters points his net gun at Zeraora and fires. ...But the net is destroyed by Pikachu's Iron Tail! 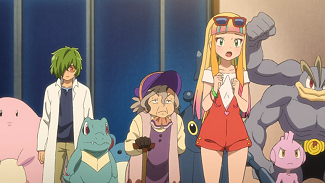 Satoshi, Lisa, Torito, Hisui, and the others all arrive on the scene and rush to Zeraora's side. The Pokemon Hunters see that they're greatly outnumbered so they decide to cut their losses and make a run for it. Lisa goes to chase after them but Hisui stops her; they've got bigger things to worry about now. Everyone sees the sacred flame, propped up against the building, and realize that Largo's the one who stole it. Oliver approaches his daughter and asks her if she realizes the severity of what she's done. She says that she does but that she had no other choice; she only wanted to protect Zeraora. She tells her father about how she was out playing in the mountains a while ago when some boulders up above suddenly came loose and started falling her way. Largo thought she was done for when Zeraora appears out of nowhere and shields her from the rocks! The effort greatly weakened Zeraora, however, so she's been taking care of it these last few days until it's strong enough to be off on its own. But then Kagachi came along with his "su~per rare pokemon" story and Largo got scared. What if everyone starts coming into the forest to go looking for it? How could she let them do that to her savior? 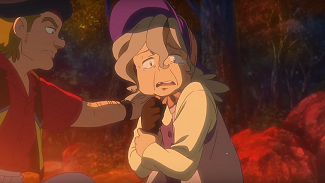 Oliver recognizes his daughter was only trying to help her friend and decides that it's time she learn the truth about Zeraora. He tells her that during that big fire 50 years ago the humans of Fuura City only worried about saving themselves and basically left all the pokemon in the forest to fend for themselves. Zeraora had to single-handedly save them from burning to death and so, because of this, Zeraora sees humans as selfish creatures who only care about themselves. Zeraora's actions, meanwhile, alerted the residents to its existence and before long people came from all over for a chance to get it for themselves. 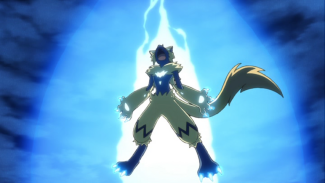 This only angered Zeraora more. At the time, the local government made the decision to spread rumors about the "curse of Zeraora" to deter people from trying to go into the forest to look for it. Up until now this idea of Zeraora's ghost haunting the area had kept the mythical pokemon safe. Suddenly, the cracks in the container of Spore Medicine the Rocket-Dan had left in the woods become bigger before the whole thing bursts altogether! A huge amount of spores start pouring out of of the container, spreading quickly throughout the forest. A trio of Poppo are seen flying toward Satoshi and the others before their wings seize up and they all fall to the ground. Torito recognizes the symptoms as being from the Spore Medicine. The mayor gets a phone call telling him that the giant cloud has reached Fuura City and that its residents are all rushing around to seek shelter. He's asked to return to the city right away. In the city, Kagachi is running around looking for his family. He gets a phone call from Mia telling him that the two of them are stuck in a ropeway car but that they're otherwise fine. Kagachi knows that it's not good for Lily to be up there for too long so he frantically runs around trying to find someone to help. As chaos spreads below our heroes decide they have to do something. Satoshi takes this opportunity to get everyone ready to act. "We can protect Fuura City ourselves! Even the things we can't do by ourselves can be achieved if we're together with our pokemon! That's the power of pokemon!" Everyone becomes motivated by this speech and work together to come up with a plan. First, Torito will need to go back to his lab to create an antidote to undo the effects of the Spore Medicine. But how will they spread it out to everyone? That's where Hisui comes in; she built the old abandoned power plant on the outskirts of town and figures there's about a 50/50 chance she can get it running again. If they can release the medicine into the propellers' air path then that should be enough to spread the medicine to everyone who needs it. 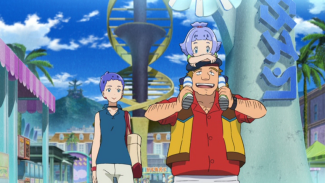 Oliver, Torito, and Hisui all head back to town while Satoshi, Largo, and Lisa stay behind with Zeraora. Once back in the city, Mayor Oliver is briefed on the situation. People have sought shelter in the nearby Pokemon Center while others have been told to stay in their homes. The Rocket-Dan, who are back at selling fruit juice again, take shelter - fruit cart and all - inside said Pokemon Center. The mayor gets on the city's PA system to calm down its citizens and to also come clean about this so-called "curse of Zeraora." Hisui goes home to pick up the key to the power plant. Outside, Kagachi is still wandering around. What can he do!? Suddenly he's approached by Usokkie yet again. This time, Usokkie grabs Kagachi's hands and reveals that it fished out the Monster Ball he had thrown into the trash the night before and indicates that it wants him to use it. Kagachi, touched that this pokemon would go to such lengths to join him, finally allows Usokkie to officially become his pokemon. As Kagachi hugs his new partner Usokkie notices the smoke closing in on them and makes them get a move on it. Back at the laboratory, Torito's colleagues are still packing their things up. When they see Torito approach they ask him to help them but he refuses; they have bigger problems to deal with. 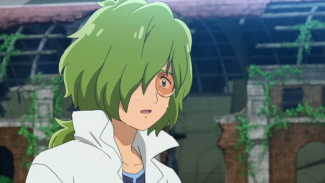 Torito then tells everyone that he knows they all hate him but that if they all work together he knows their knowledge can help save Fuura City. Torito's colleagues unexpectedly agree to help and ask Torito to lead the way. Let's start making that antidote! Out in the forest, the still unconscious Zeraora is having a nightmare. It remembers the fire from 50 years ago and the humans who tried to go after it and awakens with a jolt. It looks around and sees unfamiliar humans - mainly Satoshi and Lisa - and instantly becomes defensive. What would have been a battle is suddenly interrupted when a new explosion takes place in a power generating plant just outside the city. This "transformer substation" is what's currently providing power to Fuura City and without it the entire city goes into a blackout! Flames light up the sky, prompting Zeraora to leap into action, just as it did half a century before. Now that there's a big fire going on, Satoshi guesses they're going to need Lugia's help now more than ever. He says he and Largo will go after Zeraora while Lisa is to return the sacred flame back to the lighthouse. Lisa is shocked - why her!? - but Satoshi tells her it's because nobody will be able to reach the lighthouse faster than her. Satoshi and Largo run off for Zeraora, leaving Lisa behind. There's no way she could run again, she thinks! Her injured Eevee, meanwhile, starts to feebly drag the torch over to its Trainer. Seeing her pokemon do its best no matter what motivates Lisa to put her fears aside and do her best. She takes off her shoes, puts her hair up in a ponytail, and begins her sprint toward Fuura City. Power starts to go out all over Fuura City. This includes the lab where Torito had been working to make the antidote. The machines they were working with all stop working and there doesn't seem to be any backup generators, either! What can they do now!? But Torito soon remembers Satoshi's "power of pokemon" speech and starts to think. How can they make the antidote they need without electricity? What can they use? He notices the Rocket-Dan's juice cart in the Pokemon Center filled with Lum Berries and asks if he can use all of them to help save the city. The Rocket trio, still exhausted from the sprint they made to get there, agree. Meanwhile, Kagachi makes his way to the mayor's office for lack of knowing where else to go. Hisui's there and tells everyone that all this smoke must have shorted out the power plant and is what caused the explosion / fire. The situation outside is getting worse so everyone decides not to wait on Torito and that they should work on getting the old power plant up and working ASAP. Hisui asks for the pokemon who had been following her to help since this is a job that will require manual labor. Suddenly, Hisui doubles over and begins coughing. She soon recovers but Kagachi decides it'd be better if he tagged along. He carries Hisui up on his back as they make their way toward the old power plant. Along the way the team's path is blocked by a great fire. Kagachi wants to just put the fire out and run through - after all, the old power plant is right there in front of them - but Hisui loudly protests. 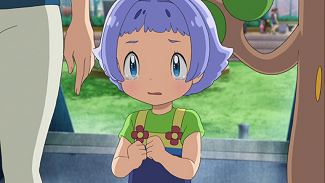 As she looks down at her gloved hand, she reveals that during that fire 50 years ago a beloved Bulu had gone into the plant to retrieve the key. 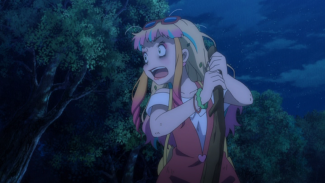 A young Hisui, who's being held back by a young man, yells at her pokemon to hurry back. 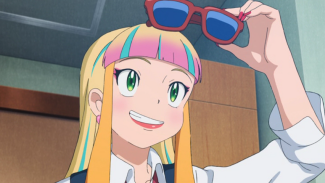 Bulu tosses the key forward as it runs toward Hisui, Hisui reaches her hand out, wraps her hand around the key...and then watches helplessly as flames engulf both her pokemon and her outstretched hand. 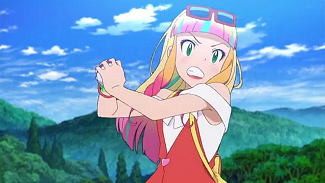 Current day Hisui looks down at her gloved hand and is scared of losing anyone else but a visit from the spirit of her beloved Bulu convinces her to keep fighting. Hisui eventually agrees to Kagachi's plan. With that, the pokemon all work together to put out the fire. 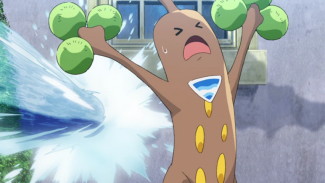 Fighing-Type pokemon like Balkie and Kairiky use their incredible strength to knock over trees, Maril and Waninoko and use their Water-Type attacks, and pokemon like Muchul use their ice attacks to cool down the area. Finally, Togepy uses Metronome to summon a Surf-like attack that puts out the rest of the fire. Now that the path is cleared Hisui, Kagachi and the others can make the rest of their way to the power plant. Lisa, meanwhile, continues to make her way down the mountain. But where is she supposed to go anyway? Suddenly she gets a phone call from her brother Riku telling her that he's found the quickest route and to follow his directions. Lisa questions why Riku knows where she is and what she's doing but she'll have time to question all of that later. Zeraora arrives at the transformer substation and starts to rescue the pokemon trapped in the area. Satoshi and Largo arrive some time later and try to lend a hand but Zeraora still isn't convinced that it can trust them. Back at the laboratory, Torito has finished the antidote! He carefully takes the one bottle his team was able to make and heads toward the old power plant. Meanwhile, Hisui and Kagachi arrive at said power plant. Kagachi wonders if this giant hunk of rust will really be able to move again but Hisui tells him to just wait and see. She inserts the key into an old control panel and turns a hand crank, causing parts of the plant begin to move. She turns toward Kagachi and the pokemon and instructs them to push on the giant turbine blades they see before them. "On my mark...go! On my mark...go!" It takes some time but moss begins to fall off the giant turbines outside as the power plant moves for the first time in half a century. At the current power plant, meanwhile, Zeraora decides to attack Satoshi and Pikachu. 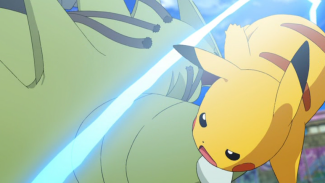 Pikachu fights back but is soon overpowered by the mythical pokemon. 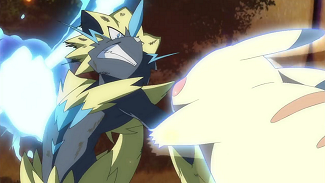 Zeraora attempts to finish the battle with a powerful electric attack but Satoshi jumps in the way and takes it on Pikachu's behalf. Satoshi falls forward, unmoving. As Pikachu and the other pokemon gather around the young Trainer Zeraora is surprised to see a human act so selflessly. Satoshi quickly regains consciousness and picks himself back up. Torito arrives at the old power plant with the antidote. He's amazed to see that the windmills seem to be working again, more or less. Kagachi volunteers to be the one to throw the antidote into the propellers at the top of the power plant to spread the medicine throughout the city but Torito warns him that it's going to be risky. After all, that's the only bottle his team was able to make. Kagachi says that the fate of his niece is also on the line so he has just as much to lose as anyone else. Kagachi and Usokkie climb up to the roof as Torito and Lucky join the others in continuing to push the turbines. Above, Kagachi and Usokkie watch as the giant turbines turn. Usokkie powers up a stone-based attack (maybe Rock Throw? It's never identified by name) as Kagachi takes a deep breath and throws the bottle. Usokkie uses the rocks its generates to clear away any stray debris that threaten to get in the way before smashing the glass and releasing the antidote. The medicine disperses through the air, exactly as planned! Kagachi and Usokkie make their way down and start to celebrate with Torito and the others but Hisui cuts them short to let them know that their celebrations are a bit premature; not all their problems have been solved yet. Zeraora, Satoshi, Largo, and the wild pokemon in the area all work to put out the massive fire but they clearly don't have the manpower needed. What can they do? Luckily, the mayor arrives with a bunch of the townspeople behind him and offers to help. Zeraora is defensive, naturally, until Oliver does a 90 degree bow to Zeraora and asks it to let them help. He then orders the townspeople to spread out and start working on putting out the flames. Some of the Water-Type pokemon are put to work putting out the flames while the Electric-Types - Pikachu included - work to restore power to the plant's sprinkler system. Their efforts work and the before long the sprinklers turn on, dousing the plant in water. The fire's not out completely but at least they're making progress! The people and pokemon in the area all cheer loudly. It seems like everything's going to be OK! Suddenly, one of the plant's towers comes loose and starts falling straight toward Largo! Zeraora leaps into action and catches the tower and then summons every last bit of power it's got to place the tower back in its previous position. Zeraora succeeds but the exhaustion from this work causes it to briefly lose consciousness and fall helplessly toward the earth. Various pokemon in the area use some kind of cotton / foam attacks to create a cushion that saves Zeraora from being flattened on the ground. Down below, Lisa has finally arrived at the lighthouse where the sacred flame needs to be set. She climbs up the pedestal, since the elevator is no longer working, and places the sacred flame in its rightful place. A giant beam of light shoots into the sky. Suddenly, the legendary pokemon Lugia appears on the scene as if to answer Lisa's call! The high school student asks Lugia to please put out the fire at the power plant and, after pausing a bit, the legendary pokemon flies into the air and sends down rain that clears up any remaining fires throughout the city. The wind can also be seen returning to Fuura City. Later that night, the people of Fuura City all gather together for the closing ceremony of the Wind Festival. As they release lanterns into the air the mayor recalls the words of a young boy: "Even the things we can't do by ourselves can be achieved if we're together with our pokemon!" After the end credits, Lisa bursts into Riku's hospital room to find him dressed up as the famous PokeTuber MC PokeRan! But nevermind that; Lisa, holding the sunglasses he gave to her before she set off on her journey, demands to know how he knew where she was. Elsewhere, Satoshi and Pikachu leave for their next journey. 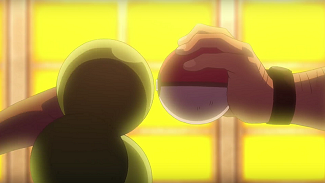 What kind of new and exciting pokemon will they meet next!? 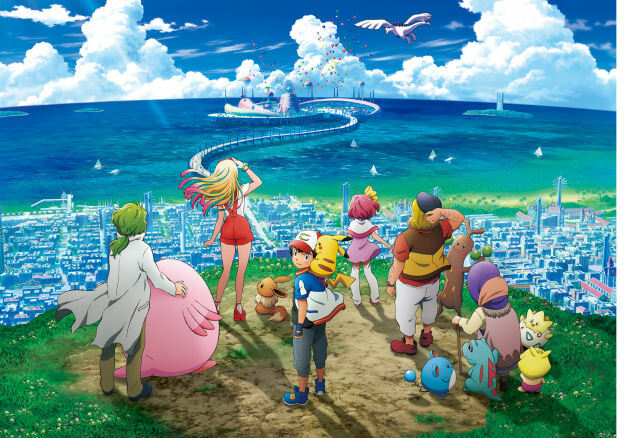 Back to the page for Pocket Monsters The Movie "Everyone's Story"